A view of flooding and destruction in Natori city, Miyagi prefecture, Saturday, after a tsunami was unleashed by an 8.9 quake. An 8.9-magnitude earthquake hit northern Japan today, triggering tsunamis that sent a wave filled with boats and houses toward land. Hawaii and the U.S. West Coast are under a tsunami warning. Are you in an affected area? Send an iReport. Read the full report on how the quake hit Japan and generated a Pacific-wide tsunami. [11:01 p.m. ET, 1:01 p.m. Tokyo] At least 398 people are dead and 805 are missing after the massive earthquake in Japan, the Kyodo News Agency reported Saturday. Earlier, the news agency said the death toll from the massive earthquake would likely surpass 1,000. [10:01 p.m. ET, 12:01 p.m. Tokyo] As rescue crews continue to account for the damage caused by the country's largest earthquake on record, people in Japan on Saturday are struggling to contact loved ones near the hardest hit areas. Lucy Craft, a freelance correspondent in Tokyo, has a teenage son at a high school near the epicenter in Sendai, northeast of Tokyo. More than 18 hours after the quake, she hadn't been able to make contact. "The phone lines are still down... I haven't been able to get in touch with him by cell phone, I haven't been able to contact anybody there. I have his teacher's phone number," Craft said Saturday morning in Tokyo. "It's a very upsetting situation, as you can imagine." [10:32 p.m. ET, 12:32 p.m. Tokyo] Residents of northern Japan streamed south from their earthquake-stricken hometowns Saturday, crowding stores in search of vital supplies as rescue teams worked north toward the historic quake's epicenter. Roads and buildings showed cracks as far away as 200 kilometers (125 miles) from Sendai, the closest city to the epicenter. One man told CNN the scene in towns hit by the quake and the resulting tsunami was "unimaginable." Shoppers were polite but tense as they sought food, water and gasoline from stores where shelves were quickly emptied and pumps soon ran dry. [9:20 p.m. ET, 11:20 a.m. Tokyo] ﻿At least 200 people are dead in Japan, 700 are missing, and the death toll is increasing every hour since a devastating earthquake hit the country Friday, Japan's ambassador to the United States said. "This is the most terribible earthquake we've had," Ichiro Fujisaki told CNN's Piers Morgan. "This is a terrible incident that has hit Japan." At least six million homes are without electricity, accounting for about 10 percent of Japan's households, he said. The government is responding to recovery efforts with 8,000 self-defense forces, and the Coast Guard is contributing 300 ships and 40 airplanes, he said. "We are mobilizing all we can." [8:30 p.m. ET, 10:30 a.m. Tokyo] ﻿Ecuadorian President Rafael Correa ordered the evacuation of the Galapagos Islands and of cities along the country's coast Friday. [7:45 p.m. ET, 9:45 a.m. Tokyo] ﻿Potentially dangerous problems cooling radioactive material appear to have cropped up at another of the Tokyo Electric Power Company's nuclear plants. Kyodo reported Saturday the power company alerted authorities that the cooling system at three of the four units of its Fukushima Daini plant - which is different from the Fukushima Daiichi reactors, nearby in northeastern Japan in the Fukushima prefecture - has failed. The news agency also reported Saturday that Japan's nuclear safety agency ordered the power company to release a valve in the Fukushima Daiichi plant's "No. 1" reactor, in order to release growing pressure. This comes amid Kyodo's reports, citing the same Japanese agency, that radiation levels were 1,000 times above normal in the the control room of that facility's "No. 1" reactor. [6:50 p.m. ET, 8:50 a.m. Tokyo] California Gov. Jerry Brown declared a state of emergency in Del Norte, Humboldt, San Mateo and Santa Cruz counties Friday after tsunami waves moved ashore in those areas. [6:45 p.m. ET, 8:45 a.m. Tokyo] In addition to the United States, 24 countries have offered to provide assistance to Japan, including the dispatch of rescue teams, and the provision of relief supplies and transportation, the foreign minister said, according to Kyodo, among them: Australia, China, South Korea, Mexico, Thailand, New Zealand, Singapore, Indonesia, India, Russia, Turkey, Germany, France, Belgium, the United Arab Emirates, Switzerland and Jordan. [6:15 p.m. ET, 8:15 a.m. Tokyo] As day breaks Saturday in Japan, tsunamis continue to wash ashore on the Pacific northeast coast, toss about cars and boats like toys and forcing residents to seek refuge on the roofs of buildings. A fire has broken out in the city of Kesennuma, NHK reports. At least 427 are dead, with 200 to 300 bodies unidentified, NHK reports. [5:15 p.m. ET, 7:15 a.m. Tokyo] A 25-year-old man who was washed out to sea while trying to photograph the tsunami in northern California was confirmed dead Friday, according to Del Norte, California, authorities. [4:50 p.m. ET, 6:50 a.m. Tokyo] Chile upgraded a tsunami warning to an alert for residents of the Easter Islands on Friday evening and urged coastal residents of Chile to evacuate to higher ground, CNN Chile reported, citing the country's interior minister. Elsewhere, Ecuadorian President Rafael Correa said Friday that off-shore drilling has been halted because of the tsunami warning triggered by the 8.9-magnitude earthquake in Japan. [4:45 p.m. ET, 6:45 a.m. Tokyo] Radioactive substances could have already leaked at the quake-hit Fukushima No. 1 nuclear plant, the operator Tokyo Electric Power Co. said Saturday, according to Kyodo News. [4:14 p.m. ET, 6:14 a.m. Tokyo] What's next for Japan? Robert Jensen, whose company assists in natural disaster recovery efforts, says, "right now Japan is in the life-saving, immediate-response mode, not the recovery mode. In the next several days as it moves to recovery mode, Japan will have to take care of its citizens and meet the basic needs of food, water and shelter." The Japanese are very good at this, he says, but the scope and scale this time are significantly greater. "Japan hasn’t seen damage like this since World War II." [3:56 p.m. ET, 5:56 a.m. Tokyo] An estimated 6.3-magnitude earthquake has hit near the west coast of Honshu - the latest in a series of aftershocks and fresh temblors that struck on and around Japan's largest island within a span of 70 minutes early Saturday morning. A 6.2-magnitude quake hit at 3:59 a.m., followed by six more with magnitudes no less than 5.2. [3:44 p.m. ET, 5:44 a.m. Tokyo] At least 184 people have been killed, 722 have been injured and 530 are missing after the 8.9-magnitude earthquake that hit Japan on Friday, according to the official count by Japan's National Police. Between 200 and 300 bodies have been found in the coastal city of Sendai in Miyagi Prefecture following the subsequent tsunami that struck that area. The official death toll is likely to rise as there are few casualty counts yet from the worst-hit areas. [3:17 p.m. ET, 5:17 a.m. Tokyo] Large sections of highways in the Tokyo metropolitan area and the Tohoku region were closed after the quake. Air transportation was also heavily affected, The Japan Times reports. A total of 711 flights were canceled at domestic airports, according to the Ministry of Land, Infrastructure, Transport and Tourism. About 13,000 people were stranded at Narita airport in Chiba Prefecture and 10,000 at Tokyo's Haneda airport. [3:00 p.m. ET, 5:00 a.m. Tokyo] Japanese authorities have informed the IAEA’s Incident and Emergency Centre that today’s earthquake and tsunami cut the supply of off-site power to the Fukushima Daiichi nuclear power plant. In addition, diesel generators intended to provide back-up electricity to the plant’s cooling system were disabled by tsunami flooding, and efforts to restore the diesel generators are continuing. At Fukushima Daiichi, officials have declared a nuclear emergency situation, and at the nearby Fukushima Daini nuclear power plant, officials have declared a heightened alert condition. So far been no release of radiation from any of the nuclear power plants affected by today’s earthquake and aftershocks. The IEC continues to liaise with the Japanese authorities, and is in full response mode to monitor the situation closely round the clock. [2:40 p.m. ET, 4:40 a.m. Tokyo] Tokyo Electric Power Company says it will vent possibly radioactive air from its Fukushima nuclear power plant to avoid a breakdown of the reactor's containment vessels, broadcaster NHK reports on its website. [2:21 p.m. ET, 4:21 a.m. Tokyo] An estimated 6.6-magnitude earthquake has struck Nagano and Niigata prefectures in Japan, the Kyodo News Service reported. The U.S. Geological Survey says this latest event is a 6.2-magnitude temblor. [1:42 p.m. ET, 3:42 a.m. Tokyo] Using Air Force planes, the U.S. government has sent over coolant for the Fukushima nuclear plant, Secretary of State Hillary Clinton said Friday. Japan's officials say a small radiation leak could occur at the plant after Friday's earthquake and tsunami. [1:34 p.m. ET, 3:34 a.m. Tokyo] According to the official count by Japan's National Police, at least 151 people have been killed, 722 have been injured and 530 are missing after the 8.9-magnitude earthquake that hit Japan on Friday. Additionally, between 200 and 300 bodies have been found in the coastal city of Sendai in Miyagi Prefecture following the subsequent tsunami that struck that area. The official death toll is likely to rise. [1:24 p.m. ET, 3:24 a.m. Tokyo] Japan's trade minister, Banri Kaieda, says a small radiation leak could occur at the Fukushima nuclear plant, Japan's Kyodo News Agency reported Saturday. Prime Minister Naoto Kan is planning to inspect the plant, according to Chief Cabinet Secretary Yukio Edano. [1:12 p.m. ET, 3:12 a.m. Tokyo] Tsunami of more than 8 feet recorded in Crescent City, California. [1:08 p.m. ET, 3:08 a.m. Tokyo] Sailing vessels were knocked loose from their moorings at a marina in Santa Cruz, California. Several were swamped. [1:05 p.m. ET, 3:05 a.m. Tokyo] President Obama said that Japan's prime minister told him there was no evidence so far of radiation leaks from nuclear reactors due to the earthquake and tsunami. [12:45 p.m. ET, 2:45 a.m. Tokyo] Gerard Fryer with The Pacific Tsunami Warning Center in Hawaii says they are lifting the evacuation orders for Hawaii. "The shoreline is still hazardous so we're updating the warning to an advisory. What that means is you no longer have to remain evacuated, but stay off the beach and don't tend to the water," he said. [12:39 p.m. ET, 2:39 a.m. Tokyo] Friday's quake is the strongest earthquake in recorded history to hit Japan, according to U.S. Geological Survey records. The previous record was an 8.6 magnitude earthquake that struck near the Chubu region near southwestern Honshu on October 28, 1707, that may have killed 5,000 people, said CNN meteorologist Sean Morris. That quake generated a 33-foot (10-meter) tsunami, and some scientists believe the quake may have triggered the eruption of Mount Fuji 49 days later, Morris said. [12:20 p.m. ET, 2:20 a.m. Tokyo] Damaging waves reported at Kailua-Kona on Hawaii's Big Island, Hawaii County Civil Defense Agency reports on its website. Maui police have reports of a 9-foot wave hitting Lahaina Harbor, Maui County Civil Defense Agency reports. [12:06 p.m. ET, 2:06 a.m. Tokyo] Radiation level rising in Fukushima No. 1 nuclear plant turbine building, Kyodo News Agency reports. [12:02 p.m. ET, 2:02 a.m. Tokyo] The death toll from the massive earthquake in Japan will likely surpass 1,000, the Kyodo News Agency reported. - USS Essex, with the 31st Marine Expeditionary Unit (about 2,000 Marines) aboard, is preparing to leave Malaysia for Japan. - USS Blue Ridge is in Singapore loading up with humanitarian supplies and then heading to Japan. - USS Tortuga is at a base in Sasebo, in the far south of Japan ready to assist where needed. - USS Harpers Ferry and USS Germantown are in the region and steaming towards Japan. - USS Ronald Reagan was in the region for a long-planned exercise off Korea, but now steaming towards Japan to help. - USS George Washington was docked at a maintenance pier in Japan when quake struck. Unclear what help, if any, it could provide. - USS Dubuque put to sea from Seal Beach, California. [11:54 a.m. ET, 1:54 a.m. Tokyo] A dam has broken in Fukushima prefecture, washing away scores of homes in the area, Japan's Kyodo news agency reported early Saturday. The Defense Ministry says 1,800 homes have been destroyed in Fukushima. [11:39 a.m. ET, 1:39 a.m. Tokyo] At least 133 people were killed, 722 were injured and 530 were missing after the 8.9-magnitude earthquake that hit Japan on Friday, Japan's National Police said. Additionally, between 200 and 300 bodies have been found in the coastal city of Sendai in Miyagi Prefecture following the subsequent tsunami that struck that area. The death toll is likely to rise. [11:31 a.m. ET, 1:31 a.m. Tokyo] Delta canceled 29 flights into and out of Tokyo on Friday. American Airlines canceled six flights en route to Tokyo on Friday, with some of the planes diverted to Anchorage, Alaska, and others to the Sapporo and Osaka airports in Japan. American Airlines, Delta and United have issued travel waivers for passengers flying to, from or through Japan in the next several days. The waivers will allow travelers to change their plans without a fee. [11:07 a.m. ET, 1:07 a.m. Tokyo] At least 137 people were killed, 539 were injured and 351 were missing after the 8.9-magnitude earthquake that hit Japan on Friday, according to the Kyodo News Agency, citing police. Additionally, between 200 and 300 bodies have been found in the coastal city of Sendai in Miyagi Prefecture following the subsequent tsunami that struck that area. The death toll is likely to rise as there are few casualty counts yet from the worst-hit areas. [10:59 a.m. ET, 12:59 a.m. Tokyo] About 4 million homes had no power in Tokyo and surrounding areas. [10:53 a.m. ET, 12:53 a.m. Tokyo] As the first light of dawn broke Friday in Hawaii, officials reported no significant damage from a series of tsunami waves that struck the islands after Japan's earthquake. Tsunami brought waves of nearly 7 feet to a harbor in Maui, authorities said, but other areas reported lower levels. [10:42 a.m. ET, 12:42 a.m. Tokyo] A dam has broken in Fukushima prefecture, washing away scores of homes in the area, Japan's Kyodo news agency reported early Saturday. [10:39 a.m. ET, 12:39 a.m. Tokyo] Video aired by NHK showed widespread fires in Hakodate in the southern part of Hokkaido island in northern Japan. An oil refinery was burning in Chiba prefecture near Tokyo, according to NHK, and firefighters could not get close enough to fight it because of the heat. And Kyodo said fires could be seen in extensive areas of Kesennuma in Miyagi prefecture. [10:33 a.m. ET, 12:33 a.m. Tokyo] Forecasters say waves are expected on the Oregon coast after 7 a.m. local time (10 a.m. ET). The predicted heights of the waves are as follows: Astoria, less than a foot; Clatsop Spit, 4.7 feet; Cannon Beach, 3.9 feet; Oceanside, 3.5 feet; Neskowin, 2.8 feet; Siletz Bay, 7.5 feet; Newport, 3.6 feet; Yachats, 3.9 feet; and Siuslaw River-Florence, 3.2 feet. [10:15 a.m. ET, 12:15 a.m. Tokyo] Tsunami waves resulting from Japan's earthquake rolled onto the Hawaiian Islands about every 15 minutes Friday morning, bringing waves of nearly 7 feet to a harbor in Maui, authorities said. No significant damage had been reported two hours after the first waves arrived, but officials said they will know more after sunrise. [10:13 a.m. ET, 12:13 a.m. Tokyo] The Japanese Defense Ministry is readying 300 aircraft and 40 ships to help with relief efforts, the Kyodo News agency reported Friday. [10:11 a.m. ET, 12:11 a.m. Tokyo] Expected tsunami heights in California: Morro Bay, 3.9 feet; Port San Luis Harbor, 7.1 feet; Pismo Beach, 2.4 feet; Santa Maria, 3.3 feet; Santa Barbara, 1.6 feet; Ventura, 2.9 feet; Malibu, 1.2 feet; Santa Monica, 2.8 feet; Redondo Beach, 2.1 feet; San Pedro Harbor, 1.3 feet; Huntington Beach, 2.3 feet. [9:53 a.m. ET, 11:53 p.m. Tokyo] Fire crews have been able to extinguish a fire at Japan's Onagawa nuclear plant, according to the International Atomic Energy Agency. [9:40 a.m. ET, 11:40 p.m. Tokyo] The toll in the Japan 8.9 quake stands at least 93 dead, 539 injures and 351 missing, according to Japan's National Police. 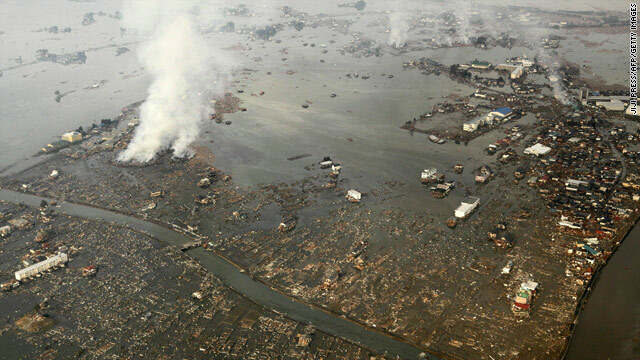 Additionally, in Miyagi Prefecture, between 200 and 300 bodies have been found following the tsunami that hit that area. [9:38 a.m. ET, 11:38 p.m. Tokyo] Officials are reporting one train derailment and loss of contact with another train in Miyagi prefecture in northern Japan, according to the Kyodo News Agency. [9:37 a.m. ET, 11:37 p.m. Tokyo] 60,000 to 70,000 people were being evacuated to shelters in the Sendai area of Japan, according to Kyodo. [9:06 a.m. ET, 11:06 p.m. Tokyo] The tsunami waves that have hit Hawaii "are not going to be a major damaging event" but will cause scattered damage, according to the Pacific Tsunami Warning Center. Waves of nearly 8 feet have been reported Friday on the island of Maui. [9:02 a.m. ET, 11:02 p.m. Tokyo] Hawaii could see waves as high as 8 feet in some areas and some resulting damage, Pacific Tsunami Warning Center says. [8:48 a.m. ET, 10:48 p.m. Tokyo] Police in Miyagi prefecture say between 200 to 300 bodies have been found in the coastal city of Sendai alone, Japan's Kyodo News Agency reported late Friday. [8:39 a.m. ET, 10:39 p.m. Tokyo] The National Weather Service said the waves could hit Oregon and California between 7:15 a.m. and 7:30 a.m. PT (10:15-10:30 a.m. ET). [8:37 a.m. ET, 10:37 p.m. Tokyo] The first tsunami waves have reached the Hawaiian Islands following a massive earthquake in Japan, local authorities say. [8:35 a.m. ET, 10:35 p.m. Tokyo] The toll following the major earthquake that hit Japan Friday stands at 64 dead and 57 missing, according to Japan's National Police. [8:29 a.m. ET, 10:29 p.m. Tokyo] Some cooling functions at Japan's Fukushima nuclear plant are not working and authorities are "bracing for the worst," Japan's Chief Cabinet Secretary Yukio Edano said Friday. There is no danger to the environment, but authorities have ordered the evacuation of a few thousand people who live closest to the plant, the Kyodo News agency reported. Others who live nearby have been urged to stay indoors, Edano said. [8:28 a.m. ET, 10:28 p.m. Tokyo] Watch a live stream from Hawaii. [8:24 a.m. ET, 10:24 p.m. Tokyo] The Japan Meteorological Agency said it cannot rule out the possibility of more tsunamis hitting coastal areas in Japan. [8:19 a.m. ET, 10:19 p.m. Tokyo] Indonesia's Bureau of Meteorology, Geophysics and Climatology has lifted its tsunami warning. Only 10 centimeter waves were reported in Bitung, Manado, North Sulawesi and Halmahera, Maluku, according to the bureau. [8:15 a.m. ET, 10:15 p.m. Tokyo] Tsunami warning lifted for Guam; no damage reported. around the Fukushima nuclear reactor Friday. [7:56 a.m. ET, 9:56 p.m. Tokyo] Live webcam on Kauai, where first wave expected at 8:07 ET. Waves could be as high as 10 feet in some areas of Hawaii. [7:51 a.m. ET, 9:51 p.m. Tokyo] First tsunami could hit Kauai, Hawaii's westernmost main island at 8:07 ET, Coast Guard says. [7:42 a.m. ET, 9:42 p.m. Tokyo] Japan has asked U.S. forces to help with relief efforts, the Kyodo News agency reported. [7:35 a.m. ET, 9:35 p.m. Tokyo] Four Japanese nuclear power plants closest to the quake were safely shut down, the U.N. nuclear watchdog agency said. About 2,000 residents near the Fukushima nuclear power plant were being told to evacuate, Kyodo news service said. [7:35 a.m. ET, 9:35 p.m. Tokyo] The U.S. State Department issues a travel alert for Japan, saying U.S. citizens should avoid travel there. The alert expires on April 1. [7:28 a.m. ET, 9:28 p.m. Tokyo] The U.S. ambassador to Japan, John Roos, has moved a U.S. Embassy command center in Japan to an alternate location as a result of numerous aftershocks following a major earthquake in Japan, U.S. State Department spokesman P.J. Crowley said on Twitter. [7:27 a.m. ET, 9:27 p.m. Tokyo] The death toll from the earthquake in Japan has risen to 59, the Kyodo News agency reported. [7:23 a.m. ET, 9:23 p.m. Tokyo] The city of Honolulu says residents who are not ill are going to hospitals seeking shelter. It is asking them to go to hospitals only if they are ill as hospital do not have facilities for them. CNN affiliate KHON reports. [7:15 a.m. ET, 9:15 p.m. Tokyo] From Matt Alt, a Tokyo resident, reporting on CNNGo: "Parts of both downtown and in the suburbs are without power. Aftershocks, smaller but still unsettling, continue to rock the area from time to time. As darkness falls over the city, only one thing is for sure. It's going to be a long night." [7:12 a.m. ET, 9:12 p.m. Tokyo] Fires were burning at more than 80 locations in Japan after a massive earthquake, the country's Kyodo News agency reported. [7:05 a.m. ET, 9:05 p.m. Tokyo] The death toll from an earthquake in Japan has risen to more than 50, the Kyodo News agency reported. [7:01 a.m. ET, 9:01 p.m. Tokyo] Sailors aboard the aircraft carrier USS George Washington docked in Yokosuka, Japan, tell Stars and Stripes the force of the quake moved the 60,000-ton ship away from the pier. [6:51 a.m. ET, 8:51 p.m. Tokyo] Hawaii's first tsunami impact may be felt at 3:07 a.m. local time (8:07 a.m. ET), according to Hawaii State Civil Defense, which issued a tsunami warning. Honolulu Mayor Peter Carlisle told CNN the city is planning for several contingencies, because it is not certain how large the waves could be and where they may rush inland. [6:45 a.m. ET, 8:45 p.m. Tokyo] Hotel fire, building collapses reported by Japan's NHK TV. [6:41 a.m. ET, 8:41 p.m. Tokyo] CNN International, citing Reuters news service, is reporting a ship with 100 people aboard has been swept away by the tsunami off Japan. [6:23 a.m. ET, 8:23 p.m. Tokyo] All major commercial airports in the state of Hawaii have been closed, CNN affiliate KHON reports. [6:17 a.m. ET, 8:17 p.m. Tokyo] The U.S. Navy air facility in Atsugi, Japan, is allowing commercial flights to land there in an effort to help commercial airports in Japan, military officials said. [6:15 a.m. ET, 8:15 p.m. Tokyo] Japan government issues emergency declaration for nuclear power plant near Sendai. Plant having troubles with electrical system, CNN's Kyung Lah reports. [6:11 a.m. ET, 8:11 p.m. Tokyo] President Obama sends condolences to people of Japan, says U.S. is ready to help in recovery. [6:09 a.m. ET, 8:09 p.m. Tokyo] Officials fear that waves from a tsunami caused by the 8.9-magnitude earthquake that struck Japan could be so high that they wash over entire islands in the Pacific, a spokesman for the International Federation of Red Cross and Red Crescent Societies said Friday. [5:59 a.m. ET, 7:59 p.m. Tokyo] Gerard Fryer of the Pacific Tsunami Warning Center says a five-foot tsunami is being indicated by buoys at Midway Atoll in the Pacific Ocean. A higher tsunami is expected in Hawaii, he tells CNN. [5:54 a.m. ET, 7:54 p.m. Tokyo] The U.S. Navy's Pacific Fleet says via Twitter that its ships at Pearl Harbor, Hawaii, will remain in port. [5:39 a.m. ET, 7:39 p.m. Tokyo] At least 32 people have been killed and numerous others injured, Japan's Kyodo news service reported. aircraft carrier to evacuate Tokyo as quickly as possible. I hear that there's a shortage of food and immediate needs at/near the quake. Can the US marine not drop it 10k ft or parachute the supplies??? Death Toll, 25,000 or 30,000 thousand?? Question: Does E = MC2 still apply? So what I want to know is why they don't treat potential earthquake sites like avalanche zones and set them off to relieve tension? While the primary reason for women's motorcycle jackets is to protect you from riding injuries when you fall, you want to look good while you're riding too, right. suits perfectly and doesn't hinder the experiencing or even vision.